Pro hackers group "Syrian Electronic Army" once again back with their hack and as like earlier hackers group which is mostly famous for hacking high-profile sites and targeting leading organisation with their cyber attacks. This time SEA hackers have targeted one of the leading web hosting company Endurance International Group INC. Hackers have hacked Endurance Group wings that includes Bluehost, Justhost, Hostgator and Hostmonster which are India's leading web solution service provider. On twitter, SEA hackers have posted the screenshots of the hacked panels of the respective web hosting company. 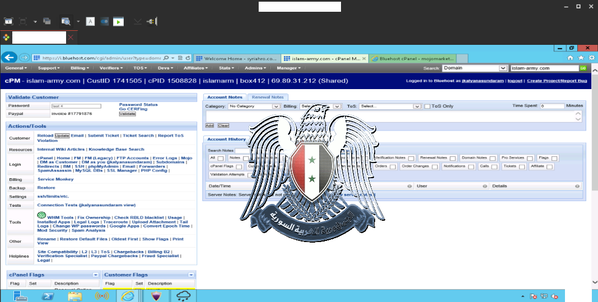 Hackers have posted a screenshot of the HostMonstor and BlueHost admin panel access which shows that they have accessed the control panel of their system . On twitter SEA hackers wrote these hosting provider were hosting terrorists websites on their server. As like earlier SEA hackers always supports Syria and its President and they had targeted all those sites which wrote against for Syria President. On one of the tweet hackers had warned BlueHost that next time they will not change the DNS. After the tweet it is confirmed that hackers had targeted hosting company as they had hosted terrorist sites. And with the follow-up tweet SEA hackers have defaced one site belongs to the terrorist group "Islam Army". 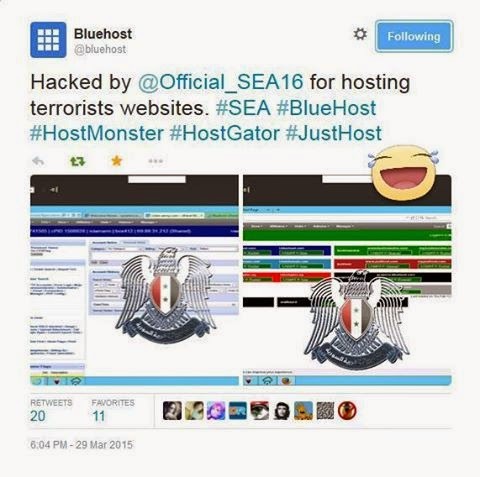 Apart from this, its seems that SEA hackers have also hacked twitter account of BlueHost. Hackers had made a tweet from the compromised account. Currently the tweet were deleted but you can see the below image of the tweet done by SEA hackers.